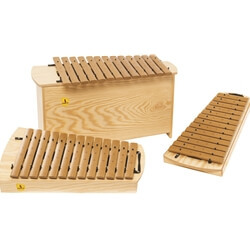 Includes 1 each of Series 1000 Alto AXG1000, Soprano SXG1000, and Bass BXG1000 Xylophones with Grillodur Bars. The Grillodur (fiberglass) bars are an excellent option where climate is a concern. Extreme temperature or humidity conditions can sometimes cause intonation or other consistency issues with wood bars. Shipping costs estimated. Call for exact pricing.